Long gone are the days of the power-hungry boss who showed no emotional insight or empathy. Think Gordon Gekko in Wall Street or Miranda Priestley in The Devil Wears Prada. 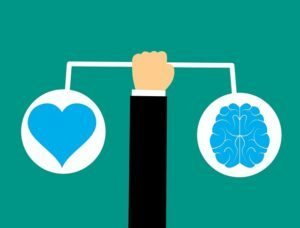 If I said that Emotional Intelligence, or EQ, is as important – if not more so – as IQ, would you agree? Or vehemently disagree? According to the World Economic Forum, Emotional Intelligence is ranked the 6th of 10 most important skills required to thrive in the workplace of the future. Why? How? Read on. Self-awareness – the ability to recognise personal emotions, emotional triggers and limitations; an ability to understand how one’s words and actions affect others and learn from feedback and mistakes. Self-regulation – the ability to manage emotions so they do not have a negative effect; to maturely reveal emotions and express them with control and restraint. Motivation – an inner drive that comes from the joy of accomplishment from personal, inner ambition. Motivation also builds resilience and optimism in the face of a disappointment or a challenge. Empathy – the ability to recognise, understand, and experience the emotions of another person; enabling one to provide a great service and respond to others’ concerns. Social skills – the ability to interact and negotiate to best meet the needs of each person. A person with social skills is able to quickly build rapport and trust and avoid power struggles. How does it help our leaders at work? EQ is particularly important for aspiring leaders, who will need to motivate people and make them feel relevant and respected. Leaders with high EQ use their social skills to nurture rapport and trust with team members; they tend to view people as individuals; they connect with employees and share in their successes alongside their challenges and concerns. These qualities are important in the face of unpopular decisions, such as redundancies. What about other benefits for employees? Emotionally intelligent people go further in their careers – they are better at managing themselves in getting along with others and stand out when it comes to promotions. People with high EQ are better at motivating themselves – they have higher levels of motivation, lower rates of procrastination, higher self-confidence and focus on attaining longer-term goals. EQ can help with mental wellbeing – people with higher EQ tend to be happier and more positive, reducing the potential of stress-related ill-health. We can improve our EQ with training and practise; paying attention and changing small things in the way we behave can make us more emotionally intelligent. We can, for instance, improve our self-awareness by paying attention to how we’re feeling at any given moment throughout the day, consider how this impacts on responses to situations and people and how this effects our decisions and interactions with others. We can improve self-regulation, looking at how we communicate with others – do we become agitated by others’ views or impatient when someone talks or become annoyed? Could we replace these negative feelings with positive perspectives? We can practise listening – to really hear what people are saying and feeling and try not to interrupt them when they are speaking. Other ways we can improve our EQ include attending training seminars, consulting books and practising new, small habits each day. This will make us more fulfilled, more motivated, more capable leaders and build a better-performing organisation.